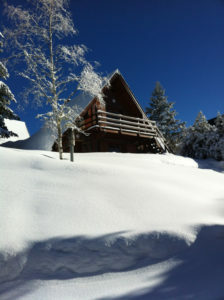 It is that time of year when I suddenly start getting lots of enquiries about ski property. The moment it turns cold and photos start appearing of snow in the mountains and ski resorts, thoughts turn to skiing, winter sports, log fires, vin chaud and the idea of a ski chalet or apartment near the slopes combined with après-ski glamour, whether that be buzzing bars, cosy restaurants or luxurious spa facilities. While the Alps have become overpriced both for property and for skiing, here in the Pyrenees, excellent value ski properties can still be found for buyers seeking bolt-holes they can use winter and summer, rent out easily and hopefully reap some eventual capital gain. The last decade has seen massive investment in the resorts here in the Pyrenees, resulting in better access and faster lifts, many more snow-making machines and better infrastructure. Surprisingly, however, property prices have not risen at the same rate as these improvements so that ski property in the Pyrenees is currently looking like a very good buy. In addition, skiing and holidaying in the Pyrenees is still relatively affordable, most notably, when it comes to ski passes, food and accommodation thanks to the fact that, in the mountain villages of the Pyrenees, the restaurants and shops are mostly small family run enterprises whose primary aim is simply to make a living. This is not an area of commercial savvy and most small businesses have been here for generations. They also tend to operate year-round as part of the local community, as they have for centuries, as opposed to fleecing the tourists as much as possible during the few short months of the winter season. It is the same story with lift passes which are around half the price of those in the Alps. So not only is the dream of a ski property achievable here in the Pyrenees, you will also save money when you come on holiday and there is also an excellent year-round rental market. « Why is there no option to pay to watch the BBC outside of the UK?